Two New York men were charged today with distributing “Breaking Bad”-branded heroin that was so potent it caused the overdose death of three users, according to federal officials. Dennis Sica, 36, and John Rohlman, 25, are named in a criminal complaint charging them with conspiracy to distribute heroin, which carries a mandatory minimum of 20 years in prison due to the deaths resulting from the drug’s sale. 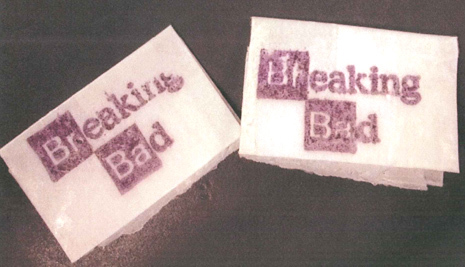 The “Breaking Bad” heroin is seen in the above Drug Enforcement Administration evidence photo. The glassine envelopes are stamped with the logo from the popular cable TV drama about a high school chemistry teacher who turns into a methamphetamine trafficker. According to prosecutors, the “Breaking Bad” heroin was “laced with fentanyl, a synthetic opioid that is significantly stronger than street heroin.” Sica and Rohlman have been accused of distributing the heroin between late-2013 and February 2014, when Sica was arrested for drug possession following a vehicle stop. The “Breaking Bad” heroin, investigators allege, triggered the December 2013 death of a 20-year-old New York man, and the February 2014 deaths of a Connecticut woman, 35, and a 31-year-old New York man. 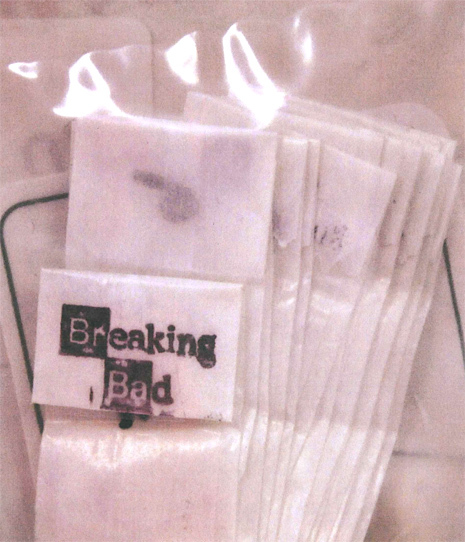 The below DEA evidence photo shows “Breaking Bad” heroin packages that were recovered by investigators following a January overdose by a Dutchess County woman who subsequently cooperated with federal agents. The woman, identified as “Witness-4” in the federal complaint, told agents that during conversations with Sica, the accused drug dealer “confessed to her” that three customers died from using heroin he sold them.